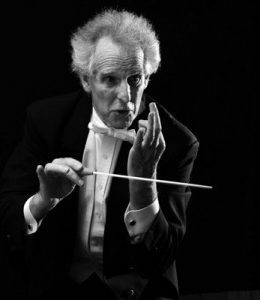 Benjamin Zander is a gifted and captivating conductor. He has conducted The Boston Philharmonic Orchestra since its formation twenty years ago, and also conducts Boston’s renowned Youth Philharmonic Orchestra. In 1967, Mr. Zander joined the faculty at New England Conservatory, where he taught an interpretation class, conducted the Youth Philharmonic Orchestra, and conducted the conservatory orchestras. For 30 years he was the Artistic Director of the joint program between New England Conservatory’s Preparatory School and The Walnut Hill School for the Performing Arts in Natick, Massachusetts. Respected in corporate and political circles, he has addressed numerous groups, many of the Fortune 500 companies, the World Economic Forum in Davos and other prestigious gatherings of world leaders. He has given both the opening and the closing Keynote address at the World Economic Forum in Davos, where on another occasion he was awarded the Crystal award for „outstanding contributions in the Arts and international relations”. In 2002 he was awarded the „Caring Citizen of the Humanities” Award by the International Council for Caring Communities at the United Nations. In honor of his 70th birthday, and 45 years of teaching, he was recently awarded an Honorary Doctorate by the New England Conservatory. He wrote ‚Bridges to Possibility’ with noted psychotherapist Rosamund Stone Zander, a book dedicated to leadership and creativity. He employs the model of music as an analogy for corporate life. Effortlessly translating his accomplishments, he relates to the business arena in a spellbinding performance. In doing so, he awakens your perspective on leadership, creativity, coaching and teamwork.